-9: A Scott (Aus); -8: S Garcia (Spa); -5: B Barber (US), J Thomas (US); -4: G McDowell (NI); -3: V Singh (Fij), R Fowler (US). Selected others: +1: G Owen (Eng); +2: J Donaldson (Wal), R Knox (Sco), A Sullivan (Eng); +4: P Casey (Eng), I Poulter (Eng), P Harrington (Ire). 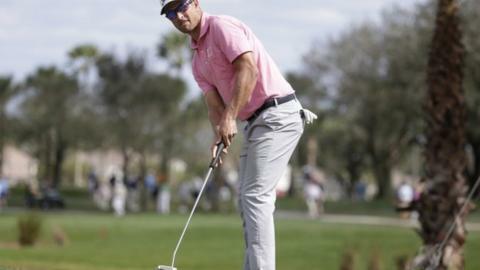 Australia's Adam Scott ended a two-year PGA Tour title drought by winning the Honda Classic by a shot from Sergio Garcia at Palm Beach Gardens. World number 13 Scott shot a level-par 70 in blustery conditions at the PGA National to finish nine under. Garcia was level after 10 holes, but bogeys at the 16th and 17th cost him. It was 35-year-old Scott's 12th PGA Tour victory and his first using a conventional putter since the 2010 Singapore Open. Northern Ireland's Graeme McDowell shot a final-round 69 to finish fifth on 276, five shots behind Scott.